I had a lengthy dwi trial this week. My client was charged with dwi following a roll-over accident. The police took her to the hospital where a nurse withdrew her blood. The State claimed a blood alcohol concentration of .25%. The Judge allowed the laboratory certificate into evidence despite clear authority that prohibits the introduction. I have always despised injustice. I get passionate in the face of injustice. The Court’s ruling was quite disturbing. There is New Jersey legal authority supporting the defense position that the laboratory certificate is inadmissible without the technician being available for cross examination. From a constitutional point of view, the Defendant has a right to confront the accuser – thus, since a document cannot be cross-examined, the facts contained in the document cannot be admitted against a defendant. In addition to New Jersey Law, there was a recent United States Supreme Court case, Melendez-Diaz v. Massachusetts, that without question, prohibits the introduction of a laboratory certificate without producing the laboratory technician. My client was found not guilty of careless driving, and not guilty of dwi based on the observations. She was however, found guilty of dwi but based only on the laboratory certificate showing her blood alcohol concentration. The guilty finding was based solely on a document that was improperly admitted. The sentence was, at my request, held in abeyance (“stayed”) pending an appeal. I am 100% confident that the conviction will be overturned. The trial, and the injustice, took a lot out of me. I had to take some time off to decompress from my disappointment and disgust. I felt terrible for my client who I believe got shafted by the system. The Court’s ruling was so clearly against the prevailing law – not just any law, but United States Supreme Court Law! I took some time off and spent it with my wife and two kids. 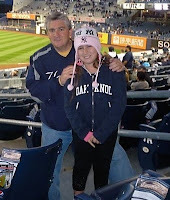 I closed my office and took in a Yankee game with one of my daughters. I am heading back into my office to file the appeal. I will post the result. I am very confident the final ruling will be a reversal. I am filing a De Novo Appeal from the September 29, 2009 conviction in the above matter(s). Obviously, I disagree with the Court’s ruling that allowed the laboratory certificate to be entered in evidence without the presence of the laboratory technician. I am puzzled by the State’s position. I am baffled (and frankly bothered) that the State would seek to introduce the certificate into evidence in light of the prevailing law on the issue. I am enclosing a copy of the United States Supreme Court decision in Melendez-Diaz v. Massachusetts, which I cited and referred to on September 29, 2009. That case is directly on point and disallows the introduction of the laboratory certificate without the technician being present. In the interests of justice and morality, I would ask that you formally take a position with the ******* County Prosecutor’s Office for this appeal. In light of Melendez-Diaz v. Massachusetts, the State successfully and erroneously moved (over defense objection) the blood test results into evidence. I will await your review and reply.